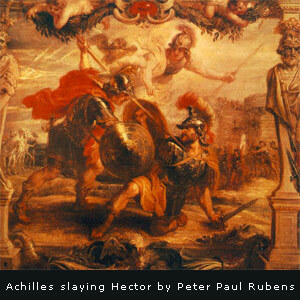 Achilles was a powerful hero in Homer's Iliad, and undoubtedly the greatest warrior on the battlefield at Troy. In his youth, he had been a pupil of Chiron. When Achilles was just an infant, his mother immersed him in the river Styx, which separates the land of the living from the land of the dead, to confer on him immortality, and to make him invincible in battle. But when doing this, she committed a grave error. Through her oversight and negligence, she held Achilles by his left heel when immersing him in the river Styx, and forgot to immerse his heel as well. And so, in spite of his great power and strength, and unsurpassed skill and prowess in battle, Achilles remained with one weak or vulnerable spot, his left heel, which was ultimately to prove fatal. In the final battle of the Trojan War, as Troy was being sacked and burned by marauding Greek soldiers, Achilles was shot in his left heel with a poisoned arrow, which finally killed him. We all have our weak or vulnerable areas, our Achilles' heels. Even someone who may outwardly appear to be all-powerful, or even invincible, isn't without a weak spot, or Achilles' heel. We may seem to be impervious to all harm until an injury, microbe or other pathogenic factor comes along that has the ability to specifically target or exploit our weak spot, or Achilles' heel. As the myth of Achilles so aptly symbolizes, our vulnerable areas, or Achilles' heels, are usually either genetic, or handed down from our parents; or the result of some prior denial, neglect, or other unconscious behavior; or both. It would greatly benefit all of us to take a long, hard look at our vulnerable areas and consider carefully what we can do to ameliorate, remedy or eradicate them. But all too often, it's much easier to take the path of least resistance and fail to do anything significant or decisive, thereby allowing the vulnerable area to fester and grow. The morbid humors, toxins and microbes that cause chronic and degenerative diseases are basically opportunistic in nature; their inherent tendency is to seek out or gravitate towards the weak spots or vulnerable areas of the organism, where they focus their attacks and become entrenched. This is another important reason why we should make every effort to strengthen, vitalize and shore up our weak spots, or areas of vulnerability.